Technology alone is not enough to combat cyber threats. At FireEye we use a unique innovation cycle that combines technology with expertise to continuously improve solutions at a speed and sophistication unmatched in the industry. Applies threat intelligence, automation, and case management to FireEye and third-party solutions in a unified security operations platform. Provides network visibility and protection against the world's most sophisticated and damaging cyber attacks. Provides comprehensive endpoint defense, protecting users from common threats, detecting advanced attacks, and empowering response. Detects email-based cyber attacks and blocks the most dangerous threats including malicious attachments, phishing sites and impersonation attacks. Provides flexible access to FireEye's industry-recognized security expertise and threat intelligence. The FireEye Ecosystem combines technology and expertise for the best security posture. We deliver a complete suite of detection, protection, and investigation capabilities with Network, Endpoint, and Email security solutions under a unified security operations platform, Helix. Our Mandiant Consulting, Managed Defense, and Threat Intelligence services augment organizations with the resources and knowledge necessary to respond to and protect organizations against even the most advanced threats. Security OrchestratorIntegrates and automates technologies and processes across your IT infrastructure. File ProtectDetects and blocks malware in network file shares. Small and Midsize BusinessesSimple, affordable cyber security solution for your growing enterprise. 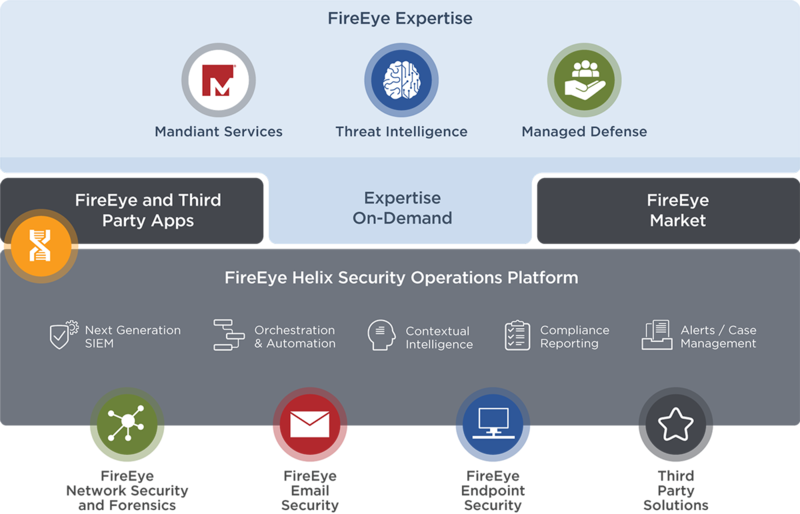 FireEye Security SuiteGives mid-market customers fully integrated, enterprise grade security that detects, protects and responds to network, email and endpoint threats. Forensics & InvestigationNeutralize threats with intelligent, cutting-edge investigative and analysis tools. Network ForensicsDevelop attack context in near-real time and facilitate rapid investigations. Malware AnalysisProvides a secure virtual environment to test, replay, characterize, and document advanced malware. Endpoint ForensicsRapidly prevent, detect and respond to threats with comprehensive, intelligence-driven endpoint visibility. CloudHolistic cloud solutions to provide protection, visibility, detection, and services. Financial ServicesYour top cyber security challenge is your obligation to protect your clients’ assets. GovernmentCounter the evolving threats to mission critical government networks and critical infrastructure. HealthcareProtect patient data, clinical research and critical infrastructure. Higher EducationSafeguard your valuable student, faculty and staff data and intellectual property. Industrial Control SystemsProtect industrial networks and ICS/SCADA systems from sabotage and espionage.